Finding the right kitchen cabinets for a new kitchen or a kitchen you’re planning to update can become increasingly difficult. You find a style of cabinets that suit your new kitchen perfectly, except you come to find out they’re too large! Scenarios like this make you wonder how you still have any hair remaining on your head, or they provide answers to your questions about why you don’t have any hair remaining on your head. Hair or no hair, you deserve a kitchen with the perfect style of cabinets (there’s no prejudice here, folks). Well maybe there is a little bit of prejudice, but it’s not aimed towards any person. Instead, the prejudice is reserved for cabinets that are not custom made. There are just too many benefits in providing your kitchen with custom made cabinets. The cabinets you find online or at home improvement stores give you some options, but those options prove to be limited. With custom cabinets, you’re given complete control over the materials, colours, finishes, glazes, accents, sizes, etc. for the cabinets in your new or updated kitchen. As touched on above, customized cabinets offer you the ability to add the perfectly sized cabinet to your kitchen. Your kitchen space might have some tricky, quirky corners that truly require a custom-built cabinet to fit the space properly. Cabinets you’ll find at the hardware store or at a retail shopping site on the Internet will not be able to accommodate those trickier areas. Simply put, custom built cabinets provide you with higher quality cabinets for your kitchen than other retail cabinets. Custom building allows for close attention to detail and special care for each and every cabinet that goes into your kitchen. In addition, custom cabinets are able to be made from the highest quality woods and materials to provide you with cabinets that last longer and withstand daily use much better than non-customized cabinets. Not only will the cabinets be more durable, but they’ll also look better, too. One major thing most non-customized cabinets lack is a sense of style, flair, and useful accessories. Custom cabinets offer you the ability to choose the accents and accessories you’d like for your cabinets to truly wow any guests and visitors in your home. You can ask for built-in spice holders and so much more with your custom cabinets. Perhaps the most appreciable aspect of buying custom cabinets for your kitchen is they provide you with a quality investment for your home. With custom cabinets, you aren’t just buying your perfect aesthetic; you’re also increasing the value of your home. A beautifully designed kitchen is highlighted by its cabinets, and custom cabinets provide an eye-pleasing boost to any kitchen. There you have it. 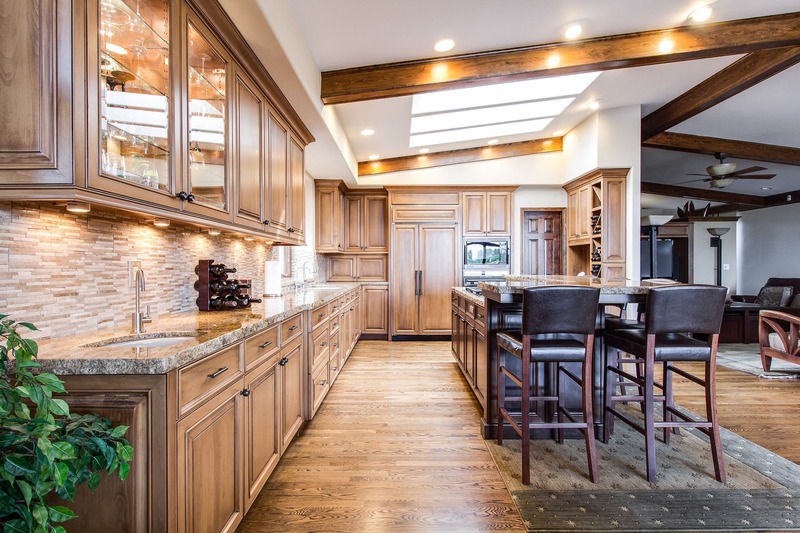 Getting your kitchen cabinets custom built provides you with undeniable benefits, especially if you’re looking to increase the value of your home.